George Jetson is employed at the Spacely Space Sprockets company by its president and his boss, Mr. Cosmo G. Spacely, where he works three hours per day for three days per week, pushing a single button. He is frequently fired, rehired, promoted and demoted by his tyrannical boss. Family members include Jane, his wife; daughter Judy; their boy Elroy; dog Astro; and robotic maid, Rosie. Although time-travel is probable in this age of technical advancement, the Jetsons spend most of their time living within the 3rd millennium. Jane is the wife of George Jetson, and mother to their children; daughter Judy and son Elroy. 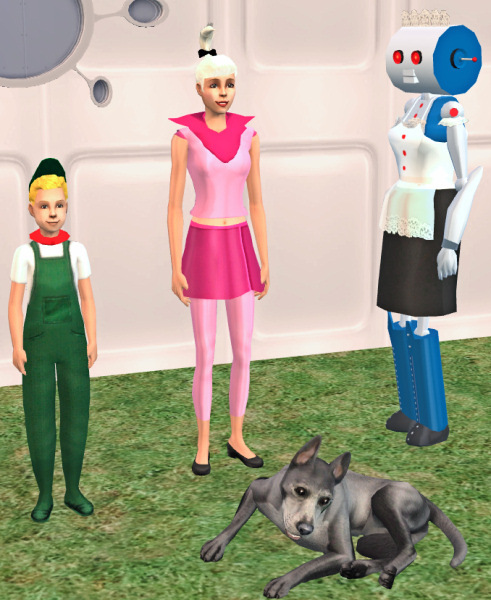 The family also has a dog, Astro; and a robotic maid, Rosie. Jane enjoys shopping at Mooning Dales, fashion, and is always on the lookout for a new look. She is a member of the Galaxy Women Historical Society. She is an art lover, and appreciates the works of the work of Leonardo de Venus and Picasso Pia. Always striving to make life pleasant for George and the family, Jane dials up great dinners daily, such as lunar locks and beetle juice. She is proud of her trim figure and slim waist, and sports sweater size 42 x 33 cm. In her mid-teens, Judy is the daughter of George and Jane Jetson, and sister to little brother Elroy. Judy has keen interest in boys, dating, boys, clothes, guys, fashion, boys, and going out. In school, Judy studies cyborg biology and astro mathematics. She plans out her day to day life by the directions of her Micro Processor Personal Organizer, and faithfully confides every secret to her digital diary, DiDi. Judy just loves shopping at Laser's Department Store, and takes after her mother with a trim figure, slim waist, and sweater size of 37 x 28 cm. She dreams of boys, and someday owning a Moonseratti to impress the boys. Approaching the pre-teen years, Elroy Jetson is about ten years old, and son of George and Jane Jetson. His big sister is Judy. He also has a dog he found, who is named Astro. A genius in all space sciences, Elroy attends Little Dipper School, where he is a straight-A student studying space history, astro physics and star geometry. Elroy loves playing with his Nimbus zoom-bot, watching House of the Planet on television with Judy, anything involving space adventures, and playing with Astro. Elroy is an all around good kid, and will not do anything wrong. Rosie is the house-hold robot of the Jetson family. She is a bit of an out-dated model as robots go, but although not nearly as technically advanced or skilled as the newer models, the Jetsons would never dream of trading her in. She is absorbed with cooking, cleaning and compulsively tidying up. Hold onto your plates! Astro is the Jetson's family dog, found by Eroy and adopted after a chaotic series of events. Not nearly a genius, but non-doofus enough to be able to speak, with most words beginning with the sound of an "r". He has coined his signature key phrases such as "Ruh-roh! ", "Ruh-roh, Reorge! ", "Right, Reorge!" and "Rats Rall Right Reorge!" Astro loves George, and displays it every time George returns home. George frequently walks Astro on an automatic dogwalker outside the Jetson residence. Invariably, Astro begins chasing a cat, causing the dogwalker to go extremely fast; upon which George loses hold of the dog leash. Astro and the cat then cleverly jump to one side, both watching as George is forced to run for his life on the out of control dogwalker, screaming for Jane to "stop this CRAZY THING!" I have also included separately each hair mesh and its textures for those who may not wish to have a full sim, or would just like the hair. These hair meshes and textures include hair for each age, in the color shown. Also included separately is each outfit, again for those who may not wish to have the entire Sim and would just like the outfit. Rosie the Robot: About Rosie. Rosie was first created as a servo, initialized as a female, and named Rosie. She was then sent to Sim Surgery to have her own unique looks applied. Thanks to Bink13y for explaining how this is done. 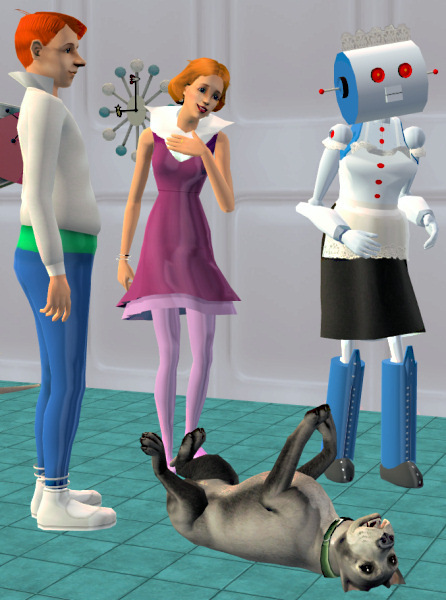 If you wish to download Astro the dog, you will need the Pets expansion. If you wish to download Rosie the Robot, you will need the Open for Business Expansion. Individual outfits and hairs do not require expansions. I have found a small bit of time to play with this family, and they are a blast! 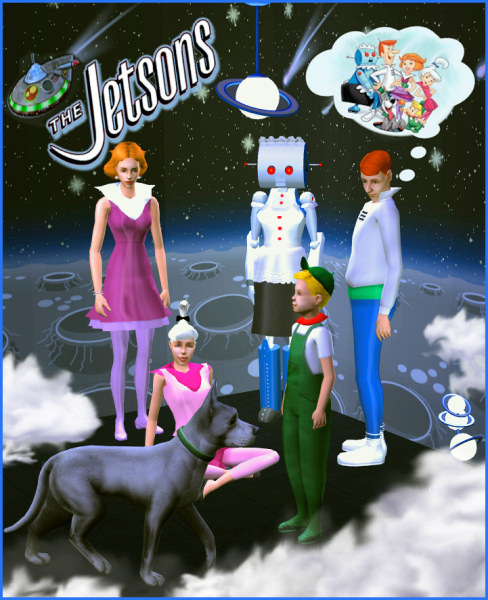 SPECIAL NOTE: For an astro-nomically fabulous place for the Jetson's to live, go to http://www.modthesims2.com/showthread.php?t=275171 for amazing structures and lots by StephSim! Big special neato thanks and credit to Bink13y for telling how to make a servo from a sim!